It’s amazing how the largest seed in the world can trigger one of the longest running health debates. Yes, we are talking about coconut. The Malaysian and Polynesian cultures have revered the coconut for centuries, and the reason is simple—it contains almost every essential nutrient your body needs for optimal health. In addition to a whole host of amino acids, coconut is also a great source of the minerals potassium, calcium, magnesium, phosphorus and manganese, as well as vitamin C and riboflavin (vitamin B2). Good, right? But here’s where the debate comes in. Coconut also contains 90 percent saturated fat, which puts it right smack in the middle of the great fat argument. There is no question that saturated fat and its evil cousin trans-fat are bad for your health. However, like most things in health and nutrition, there are good points and bad points with most everything…and the same is true of saturated fat. While there is a valid argument to avoid animal-based saturated fats, which are made up of short-chain triglycerides, the fat in coconut oil is actually a medium-chain triglyceride. While most fats are stored in your body’s cells, the fat in coconut oil goes directly to your liver, where it is converted into energy. Think of it this way. That double bacon cheeseburger you ate most likely sits around in your cells waiting to be burned up or stored as fat for later. Conversely, coconut oil gets shipped directly to your liver, where it is put to work to help you stay energized and alert all day. Even better, 45 percent of the saturated fat found in coconut is lauric acid, a medium-chain fatty acid that converts in your body to monolaurin. Monolaurin is a compound found in breast milk that strengthens a baby’s immune system and helps to promote normal brain development and contribute to healthy bones, as well as protect against viruses and bacteria.1 Plus, coconut is known to have great anti-inflammatory,2 anti-fungal3 and antibacterial benefits. So now that the saturated fat debate has been put to rest, let’s focus on more interesting matters, like the three incredible ways this amazing seed can benefit your health. Sometimes called coconut butter, coconut oil is extracted from the dried flesh of the coconut. When it comes to antibacterial benefits, coconut oil is tops. According to a double-blind, placebo-controlled study from 2007, coconut oil can help to treat skin infections, specifically atopic dermatitis.1 Researchers divided 26 participants with the condition into two groups. One used virgin coconut oil twice a day for four weeks at two non-infected sites, while the other group used virgin olive oil, also twice a day for four weeks. When the study started, 20 of the 26 participants tested positive for Staphylococcus aureus. After four weeks, only one person in the coconut oil users tested positive for the bacteria, compared to six in the olive oil group. Plus, the coconut oil relieved their dry skin. And remember that saturated fat issue? Turns out that coconut oil actually appears to be good for your heart. According to a 1981 population study of about 2,500 Polynesians from the islands of Tokelau and Pukapuka, high coconut oil consumption has no effect on cholesterol levels.4 Investigators found that even though participants ate some form of coconut at every meal, their overall health was very good and vascular disease was uncommon. In fact, they did not have high cholesterol. Moreover, coronary heart disease, colon cancer and other bowel disorders were also uncommon. And when it comes to weight loss, coconut oil really shines. Farmers in the 1940s unwittingly illustrated this benefit when they attempted to use coconut oil to fatten up their animals. They found it made the animals lean and active instead. Later, animal experiments in the laboratory compared diets that were low or high in total fat, and contained different types of fat. Results showed that animals with more unsaturated oil and less coconut oil in their diet were fatter. This was even more important than the total amount of fat consumed. In other words, the animals that ate just a little unsaturated oil were fat, and those that ate a lot of coconut oil were lean. The protein in coconut water comes from amino acids, namely threonine, isoleucine, leucine, valine, serine, proline, glycine, glutamic acid, aspartic acid, phenylalanine and arginine. This incredible nutrient profile was put into practice during World War II, when both sides of the war in the Pacific regularly used coconut water—siphoned directly from the coconut—to give emergency plasma transfusions to wounded soldiers. It’s that identical to our own human blood plasma! Other reported uses of coconut water include digestive upset—gas, vomiting, indigestion and constipation—as well as urinary issues, including acting as a natural diuretic, edema and potential treatment of kidney and urethral stones. While there is scant research to back up the digestive claims, a 2013 study does show promise for kidney stones. Researchers divided rats into three groups. The control group was given normal feed. The second and third groups were both given a substance to trigger nephrolithiasis, a condition that is marked by crystalized urine, which can lead to kidney stones. Only the third group was also given coconut water. 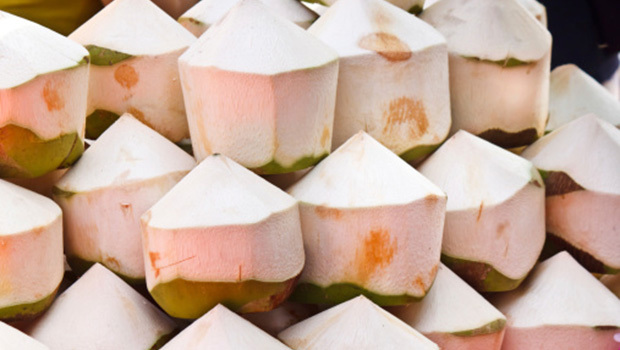 Many people incorrectly confuse coconut milk with coconut water. Coconut milk is the diluted cream pressed out from the thick, white flesh of a well-matured coconut. While coconut milk contains similar nutrients to coconut oil and coconut water, including lauric acid, it is prized more for its culinary virtues. Most coconut milk is canned, but not all brands are produced the same way. Good coconut milk has a clean, white color and tastes rich, creamy and mildly sweet with the essence of coconut. It should also have a complexity and depth of flavor that keeps you intrigued and not leave an unpleasant aftertaste. Good brands of coconut milk, therefore, will have thick cream floating on top of the can while the milk on the bottom will be much more watery. Brands that look homogenized tend to have an artificial taste because of additives introduced to make the cream homogenize, or excess processing, which changes the nature of the cream. There are many ways to use all three forms of coconut. With the oil, your best bet is to use as an alternative to other vegetable oils for cooking. Because it has such as high smoking point (350°F for unrefined and 450°F for refined), you can sauté and bake with it and not worry about it turning into a trans-fat before your eyes. Plus, coconut oil is very stable. It has a two-year shelf life, and won’t turn rancid, even in warm temperatures. Just be sure to choose organic, unrefined, virgin coconut oil to avoid unwanted heat processing or chemicals. You can also add a spoonful to a smoothie or use in place of butter on toast, sweet potatoes or even pancakes! And speaking of smoothies, both coconut water and coconut milk make great alternatives to juice or dairy when making a vegetable and fruit smoothie. With just coconut water, you can just drink right out of the seed itself or choose a bottled variety. You’d do well to avoid the flavored options, however, as they tend to be loaded with extra sugar. For coconut milk, it makes a great sauce for chicken or fish. Saute with garlic and ginger for a truly heart-healthy way to compliment any meal. No matter which way you go, you cannot go wrong when it comes to coconut.